Conan the Cimmerian (also known as Conan the Barbarian) was born in the pulp fiction of Robert E. Howard (REH), first appearing in the magazine, Weird Tales (1932). In 1970, Marvel Comics brought Conan to the world of comic books, and with only few pauses, Conan comic books have been published for over four decades. Many Conan comic book stores are adaptations of or are, at the very least, based on the Conan stories written by Robert E. Howard. 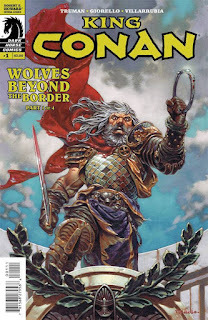 One of the most acclaimed Conan comic book writers of the last decade, Tim Truman, has taken an original REH story, “Wolves Beyond the Border,” to create the new comic book miniseries, King Conan: Wolves Beyond the Border. The artist for the series is Tomás Giorello, who has worked with Truman on earlier Conan comic books. Series colorist is José Villarrubia, and Richard Starkings & Comicraft provides the lettering. King Conan: Wolves Beyond the Border #1 (“The Iron Crown”) opens in Tarantia, the capitol of the nation of Aquilonia, where an aged Conan is king. Conan's bodyguards, Crassus and Dariun, wait in the shadows of the “Street of Dogs,” while their king lurks in the shadows of a den of thieves-type tavern. In one of his dark moods, Conan spoils for a fight., but someone is also lurking and watching the king. He is Gault, and he has come to tell a dark tale of a cursed crown, of the Picts, and of the wolves of the border. The story “Wolves Beyond the Border” is a story that REH began writing in the 1930s. It became a fragment that Howard did not finish, nor was it published in his lifetime. Conan is mentioned in the story, but does not appear in it. 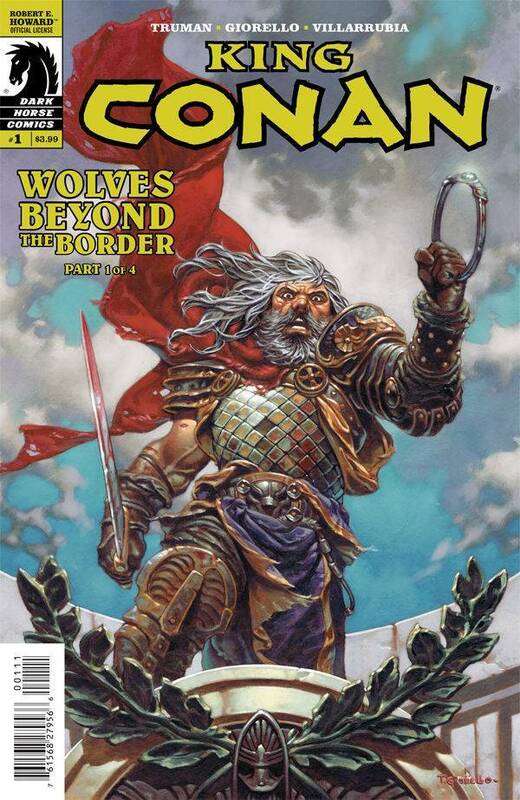 In a piece that is published at the end of this first issue, Truman writes that he has loosely based King Conan: Wolves Beyond the Border on the “Wolves Beyond the Border” fragment. That may not matter to many readers. Truman also hints that he may use the story to connect REH's three most significant characters: Kull, Conan, and Bran Mak Morn. That may matter more to the fans of REH's fiction and to fans of comic books based on his work. I am a huge fan of Tim Truman and Tomás Giorello fantastic comic book adaptation of Hour of the Dragon, the only Conan novel that REH every wrote. Obviously, I was more than excited when I read about Truman and Giorello coming together again to work on King Conan: Wolves Beyond the Border, and I am not disappointed by the resulting work. Roy Thomas was the first to write Conan comic books, and I have always thought of him as the best Conan comics writer. Truman is the next guy up for me. He retains the power and sensibility of REH and if his prose, but Truman can also create original text that seamlessly blends with REH's words. Truman's work has always mixed a sense of adventure that was every bit as imaginative and inventive as it was brawny. He does that here. Every panel is filled with language that strains against the grain, determined to break loose and to send the story careening off into adventure. Giorello takes the muscularity of Truman's storytelling, delivering the most beautiful art work that surges the narrative forward. Many of the panels are like small paintings, capturing the spirit of REH and the power of Truman's script. OMG, I need a cigarette. Four issues won't be enough, but, dear readers, we will have to take what we can get. I heartily recommend this exceptional comic book to Conan fans and to readers looking for quality comic books.